We are a cross-disciplinary translational research group focused on using genomics and transcriptomics to better understand and treat critical illness. The fundamental problem that we focus on is the lack of treatments to stop people dying from severe infections - a syndrome known as sepsis. We believe that a functional genomics approach can lead us to biological processes that might be amenable to treatment. Much of our work focuses on specific infections, such as influenza, or critical illness caused by non-infectious injuries, such as pancreatitis. We develop and apply computational tools, and use in vitro and in vivo models to generate and test hypotheses. We are based in the Roslin Institute, University of Edinburgh and Intensive Care Unit, Royal Infirmary Edinburgh. 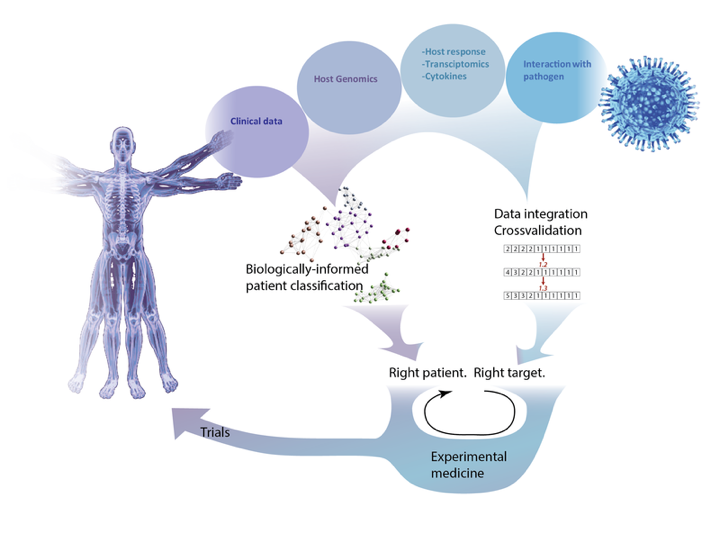 Applications of computational biology in critical care medicine. Throughout the history of medicine, progress has been made by recognizing patterns of disease, or syndromes. When new technologies are invented, they can reveal observable characteristics that have close relationships to disease trajectories, outcomes, and most importantly of all, response to therapy. Genomics and transcriptomics have these properties, but raise an additional challenge: the scale of the data is such that detecting relevant signals is a substantial computational and mathematical challenge. Russell, C. D. & Baillie, J. K. Treatable traits and therapeutic targets: Goals for systems biology in infectious disease. Current Opinion in Systems Biology 2, 139–145 (Apr. 2017). In the FANTOM5 consortium we showed that, with a sufficiently rich expression dataset, it is possible to infer functional relationships between genes (and other transcribed elements in the genome, such as enhancers and lncRNAs) by grouping them according to similarities in expression. We proved this using known pathways, but the real value of this finding is that it enables us to discover relationships between genomic regions about which almost nothing is already known.